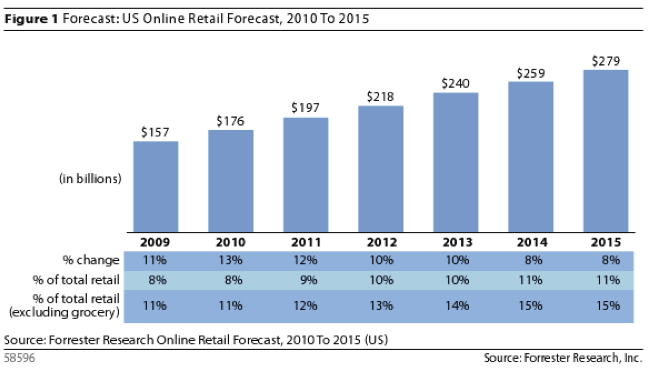 After a healthy 12.6% increase to $176.2 billion in 2010, U.S. online retail sales are expected to reach $278.9 billion in 2015. Online shopping will continue to cannibalize in-store shopping as consumers become more familiar and begin, in many cases, to prefer the convenience of online shopping, Forrester says. Increased Internet connectivity via devices like smartphones, tablets and game consoles will also drive growth, as well as new e-commerce models like flash sales (i.e. Gilt Groupe, Neiman Marcus Mid-Day Dash), daily deals (Groupon, LivingSocial) and digital downloads of media (Netflix, iTunes), all of which have enjoyed rapid adoption in recent years. E-commerce growth in 2010 was driven primarily by existing online shoppers who increased their online spending in traditional categories like books and media, and also began to purchase in less popular categories like furniture and home appliances. Thirty percent of growth was attributed to the 5.5 million consumers who shopped online for the first time in 2010. 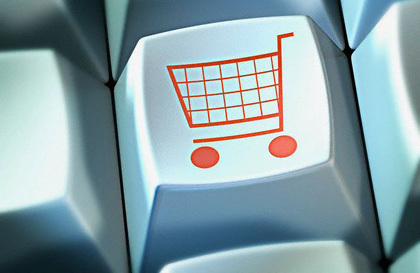 E-commerce now makes up 8% of total retail sales, says Forrester — 11% if grocery sales are excluded from the equation. In Europe, online sales grew by 18% in 2010 compared to 2009, and they are expected to grow 13% in 2011, Forrester stated in a separate report. The number of online buyers in Europe is expected to grow from 157 million to 205 million by 2015; total sales are forecast to reach 133.6 billion euros.